Will YOU Join with FAIR in the Fight to End Chain Migration? In 2015, the United States granted 1,051,031 immigrants lawful permanent resident status.1 That’s nearly enough people to populate a major city the size of Dallas, Texas. Why are so many immigrants accepted each year? As more and more immigrants are admitted to the United States, the population eligible to sponsor their relatives for green cards increases exponentially. This means that every time one immigrant is admitted, the door is opened to many more. Chain migration became the driving force behind immigration to the United States in 1965, with the passage of the current version of the Immigration and Nationality Act. The 1965 legislation changed the objective of U.S. immigration policy. Rather than admitting immigrants who were likely to assimilate to our culture and succeed in the United States, American immigration policy shifted its focus to an extremely broad concept of “family reunification.” This placed the integrity of immigrant families above the economic, national security, and public safety interests of the American public. As a result, the pool of immigrants eligible to come to the United States became largely self-selecting. While the annual cap on the admissions of immediate relatives of U.S. citizens was eliminated, most other immigrant categories remain subject to annual limits. As a result, there is a backlog of immigrant visa applications for those categories in countries like India and the Philippines. The wait can often be decades long. There is evidence that these long lines encourage many intending immigrants with marketable skills to seek admission to countries with merit-based immigration systems. 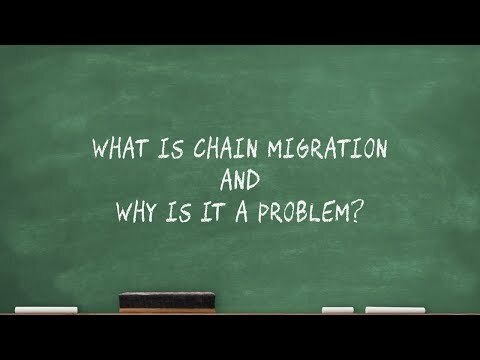 Additionally, some argue that the long waits caused by chain migration encourage people to cut the line by immigrating illegally. Simply put, chain migration doesn’t place the interests of American citizens first. As a result, many well-deserving immigrants with skills and values that could potentially enhance the cultural and economic goals of the United States are passed over in favor of the relatives of previous migrants, no matter what they bring to the table. This is unfair to both American workers and those who have worked hard to form skills that could benefit this nation. Replacing chain migration with a merit-based system would both lower the overall number of aliens accepted into the country each year, and ensure that those accepted are able to further the United States’ cultural and economic priorities. 2 Four of the five admissions categories for family immigration are reserved for U.S. citizens. This means that immigrants must become naturalized citizens to be able to sponsor relatives in those categories. An immigrant is eligible for naturalization five years after being admitted as a legal permanent immigrant (three years for the spouse of a U.S. citizen).